Frankie the flamingo and Clarence the crab were with us at Newport Primary School in Leyton, East London the other day explaining how Clarence the crab gets poo on his head when it rains. Which is not nice at all. Rain garden’s are brilliant because they stop rainwater going into the drains and sewers in the first place. Rehan (aged 8) started explaining the idea below. It was quite complicated in words so I asked him to draw it for me. Pretty cool huh? 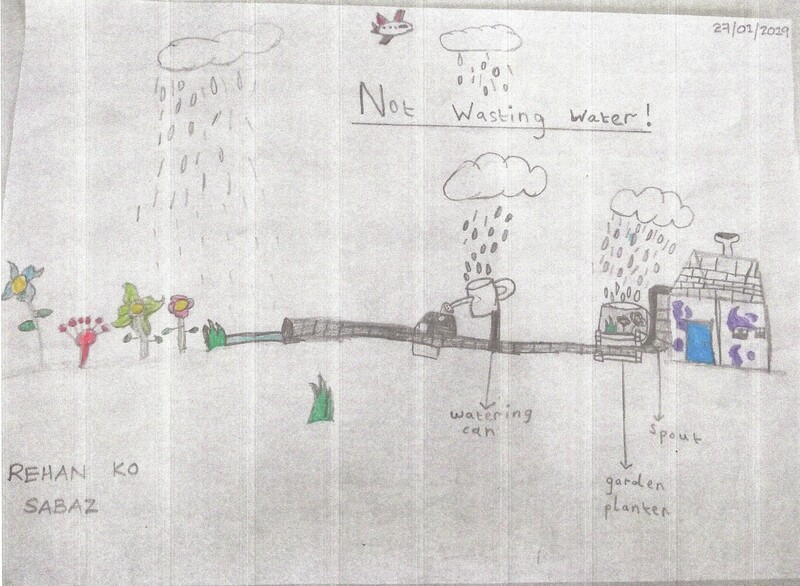 Not only is Rehan’s design collecting rainwater he has made sure he uses it all up so as not to waste a drop. And what amazing flowers he has growing at the end! Clarence and Frankie think its amazing and have told me I have to send him a copy of their book as a thank you. So I have!